The August 2 agreement on raising the country’s debt ceiling was a leading topic of conversation on both blogs and Twitter last week. And in a rarity for a partisan political issue, the news managed to unite both sides of the political spectrum. Liberal and conservative social media users agreed the deal was a bad one-albeit for different reasons. Indeed, both sides seemed to think they came out on the short end. For the week of August 1-5, the news story most linked to on blogs was the debt ceiling debate, according to the New Media Index from the Pew Research Center’s Project for Excellence in Journalism. That topic also among the most discussed subjects on Twitter, finishing at No. 2. This week’s New Media Index is the first to use an updated methodology and larger sample to determine the top subjects on social media. The NMI now employs an expanded number of sites to track the top stories and a wider pool of sources and topics within the story lists. The new process, which helps reflect the continued growth in social media and technology, results in a simple list of ranked stories rather than the percentages used in the earlier method. For more details, see the About the New Media Index section below. The drawn-out debt ceiling debate in Washington culminated in a complex bill that just barely averted a debt default. The most vocal users of social media strongly denounced the deal, a sentiment shared by many Americans according to polls that were released in its aftermath. Liberals claimed that President Obama caved in to the demands of the Republicans, and specifically the Tea Party movement, in agreeing to cuts in government spending without increases in revenue. “The reported deal on the debt ceiling is….completely one-sided-brutal domestic cuts with no tax increases on the rich and the likelihood of serious entitlement cuts in six months with a ‘Super Congressional’ deficit commission,” decried Glenn Greenwald at Common Dreams. Conservatives did not think the cuts went far enough and were concerned that the new committee would not carry through with its mission. They also felt that by increasing the debt ceiling at all, Obama and Democrats would wind up spending more money anyway. Some in social media focused on peripheral issues of the debate that did not get as much attention in the mainstream coverage. A report claiming that Vice President Biden compared Tea Party Republicans to terrorists created a firestorm in the blogosphere and on Twitter. A number of bloggers highlighted a Business Insider report that the computer company Apple has more cash than the U.S. government. And many Twitter users flagged a Mashable report about White House aides who declared that Twitter itself helped influence the debt ceiling deal as it served as a platform for voters to pressure Congress into action. The Note, a political blog on the ABC News web site, was one of the first outlets to report details of the proposed compromise. Over the next few days, people on both sides of the political spectrum weighed in with their opinions, almost all of which were negative. Liberals saw the deal as a defeat, asserting that Democrats did not fight hard enough. “We’ve always known the Dems to be wet noodles and spineless, but if they remain this way given the piranha-like opposition, there will be nothing left of them but their bones and their dignity,” protested Grey Matter at The Angry Liberal. Conservatives thought the agreement was more politics as usual and would ultimately lead to more taxing and spending. “What we know about the pending deal is that the Democrats and Republicans are agreeing to a Deficit Commission. Despite the media spin-and the spin of some Republican sycophants-the deficit commission, which will be a super committee of the Congress, will have the power to come up with new tax revenue,” predicted Erick Erickson at Red State. Tea Party conservatives criticized Republicans who helped create the deal, saying they were part of the D.C. establishment and not defending true conservative principles. “It boggles the mind how these Republicans are either so stupid they can’t figure out that they just bent over for the Democrats again, or that they genuinely seem to think that the American people are so stupid that we don’t know what they’ve done,” posted BJC’s Blog. The Tea Party further came into the conversation after Politico published a report that Biden accused its members of acting like terrorists in a closed door Democratic Caucus meeting. The subject touched a nerve and became something of a referendum on the Tea Party itself. “Now, I always thought of terrorists as people who blow up buildings, commit murder and extortion you know, who terrorize! But no apparently your political opponents who disagree with you are also terrorists,” responded Shameless Politicians. “Republicans and Tea Baggers won’t be happy until they totally wreck the economy, just so they can pin the blame for their actions on Obama,” wrote Ron Chusid at Liberal Values four days later. Beyond the political wrangling, social media took note of several connections between the debt ceiling debate and technology companies. Bloggers were interested in a report that Apple, with $76.2 billion in cash and marketable securities, had more money than the U.S. government, with its operating cash balance of $73.8 billion. “The phrase ‘richer than a small country’ is not uncommonly heard, but this is another thing altogether,” noted Joel Falconer at The Next Web. “Congratulations [Apple CEO] Steve Jobs-you’re now more powerful than one of the largest nations on Earth. “Should we just elect Steve Jobs as president?” asked Allison Kade at LearnVest. On Twitter, the notion that Twitter played a role in pressuring legislators to act on debt ceiling legislations on was significant. “Twitter helped raise the debt ceiling. Social Media prevented a second recession,” added Jeremy Burns. 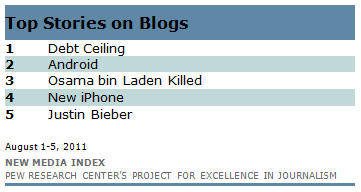 Beyond the debt ceiling debate, the most popular subjects on blogs last week focused on technology, the May raid that killed Osama bin Laden and a popular teenage singer. The No. 2 topic involved challenges facing Android mobile software. Two stories drew attention. One was a post on the official Google blog claiming that Microsoft, Oracle, Apple and other companies are waging a campaign against the Android market by filing “bogus” patents in order to make software developments for the Android expensive and difficult. The other was a blog post by CA Technologies warning users about Trojan spyware that could infect an Android device. A lengthy New Yorker story detailing the May 1 raid by Navy SEALS that killed Osama bin Laden was the third most discussed subject. Predictions that the new iPhone 5 will be launched in the coming months were the fourth biggest subject. And in fifth place was pop star Justin Bieber as bloggers linked to a Perez Hilton post showing a video of the singer playing pranks on various fast food drive-thrus and an X17 post showing candid pictures of Bieber shopping. Justin Bieber also made the list of top Twitter subjects last week, finishing as the No. 3 subject. In this case, however, most of the links were to his web site that included a list of concerts he will perform in Mexico and South America. 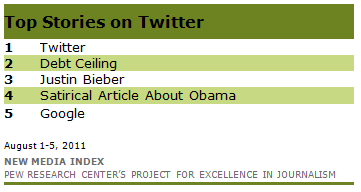 Twitter, the web site itself, was the top subject last week ahead of the debt ceiling and Bieber. The social networking site was the feature of two popular stories. One was a list of the top Twitter trends for the previous month put together by Mashable. The other was an announcement that the old version of Twitter would be discontinued soon, roughly a year after the new version of Twitter was launched. A different technology-related topic, Google, was the fifth largest subject. Most of the focus was on a study that showed Google’s new social-networking site, Google+, hit 25 million visitors in its first month. That growth was faster than for Facebook, Twitter, and MySpace over the same time frame. Although not the top video, the debt ceiling issue was also prominently featured on YouTube. Two of the top five news videos focused on the issue. The No. 2 video was a July 31 message from President Obama, posted by BarackObama.com, explaining the agreement he reached with congressional leaders. The No. 4 video, posted by Florida Senator Marco Rubio on July 30, showed the senator discussing the debt crisis on the Senate floor and debating the issue with Massachusetts Senator John Kerry. The No. 1 video last week was of a very different nature. The July 30 video shows an industrious yet controversial Lithuanian politician, Vilnius Mayor Arturas Zuokas, resorting to extreme measures in his fight against illegally parked luxury cars. At one point, the Mayor is seen driving over an expensive car in a tank. The New Media Index is a weekly report that captures the news agenda of social media, with a focus on blogs, Twitter and YouTube. These platforms are an important part of today’s news information narrative and shape the way Americans interact with the news. The expansion of online blogs and other social media sites has allowed news-consumers and others outside the mainstream press to have more of a role in agenda setting, dissemination and interpretation. Through this New Media Index PEJ aims to find out what subjects in the national news the online sites focus on, and how that compared with the narrative in the traditional press. Social media and the technologies available to help track it are also continuously changing and evolving. To stay current and reflect the social media conversation as it relates to news, PEJ must constantly re-evaluate its methods of tracking and analyses. After studying new tracking options, as well has noting adjustments made by some of the web tracking sites PEJ has used to gather posts and tweets, the Project determined that it is a good time to both update and diversify the organizations it uses to gather and sort the top news stories each day. These adjustments went into effect August 1, 2011. Since PEJ began monitoring social media in January 2009, it relied on the tracking site Icerocket to determine the most linked-to stories on blogs and Tweetmeme for the most linked to stories on Twitter. For a time, PEJ also relied on compilation for blog material with a news web tracking list from Technorati, but that tracking was suspended. The new method will continue to use the links as a proxy for measuring what social media are discussing, but it allows for a wider range of sources and expands the possible types of subjects that appear among the most-discussed. While the old method relied on one source for each type of social media, the new will rely on four, making the selection criteria more robust and the list more diverse. For blogs, both Technorati and Icerocket provide lists of the most-discussed stories at any given moment. Those will be monitored daily and a list for the week compiled. For the discussion on Twitter, two tracking sites will be used that list the top news subject each day, Tweetmeme and Twitturly. As a result of these changes, statistical comparisons between reports issued before August 2011 and those after are difficult to make. The earlier method included a percentage of links for each top story, but the new method will instead offer a simple ranking of stories in order. This new system of ranking is stronger and more intuitive because offering percentages for online content is problematic. The internet is ever-changing and growing, and there is no constant baseline or denominator to calculate percentages from. Every weekday at 9 a.m. EST, a PEJ researcher captures the lists from each of the four tracking web sites and records the five top stories on each. Each site uses a different method for the creation of their particular lists. Technorati indexes more than a million English-language blogs. The site uses its own algorithm to determine the daily list of the “Hottest Blogosphere Items” that tracks the number of blogs linking to a given story, along with the authority and influence of such blogs. Technorati does not disclose the details of its algorithm, but there are two reasons why PEJ believes the site is accurate and reliable. One, the stability of Technorati and the acceptance of its measures as an industry standard make the site a frequently used resource. Two, an examination of the top stories on Technorati over several months shows that their lists comport well with other aggregator sites. Icerocket’s list of “Top Blog Posts” aggregates the top stories discussed in the blogosphere at any given time. Based on the tracking of more than 3,000 blog posts a day, Icerocket’s algorithm incorporates the number of blogs linking to a specific article along with the “rank” or popularity of different blogs. In the previous methodology, the NMI used the page that tracked the most popular “news” stories. That list, however, has become limited to more traditional news sites. Thus, PEJ has switched to a broader Icerocket list, its Top Blog Posts page, to allow for a wider range of sources. Each of the top stories (10 combined from the two sites each weekday) is coded by PEJ staff for its primary storyline or focus. At the end of the week, researchers count the number of times each storyline appeared out of the 50 stories and determine the ranking of subjects based on those frequencies. If two or more stories appeared the same number of times, the final ranking is determined by factoring in how highly the tied stories appeared throughout the week. Tweetmeme tracks all the links from public Tweets and lists which stories were linked-to most often over the previous 24 hours. As with Icerocket, PEJ has changed the page on Tweetmeme that is followed. Previously, the NMI included the “News” page. Currently, the NMI follows the main “Everything” page so that more sources and topics can be measured. Twitturly uses a similar methodology. The site tracks every time someone tweets a URL and ranks the URLs that get the most links over the previous 24 hours. PEJ uses Twitturly’s “News” page, which includes any type of URL except for pictures and videos. The method for determining the top subjects on Twitter is the same as is used for blogs. For all the sites captured, only stories written in English are included in the sample. Links to pictures on yfrog and videos on Twitcasting will also be excluded.